Compromise is tough enough between humans. Imagine trying to compromise with an adorable mouse who has great imagination and wanderlust but no sense of distance or costs. Happy the Pocket Mouse has decided the solution to a case of the boredom blues is for him and his human, John, to go some where. For John, though, going somewhere usually means someplace close to home, like the store or the park. But Happy has other ideas, and he has lots of them. So, John recommends that they each make a list of places they’d like to go. John is thinking the woods and the river, but Happy’s thinking the Taj Mahal and New Zealand. Finally John introduces the idea of compromise, a meeting in the middle, which Happy jumps on, proposing meeting in Egypt, or Paris or even New York City, all of which John nixes based on cost. John’s suggestion about an overnight bus ride to the nearest city to see the Tall Ships finally grabs Happy’s attention, especially John’s description of them as “ghosts from the past” (pg. 23). Still, finally settling down for the night, the excited little mouse checks with John about one potential stop on the way home! 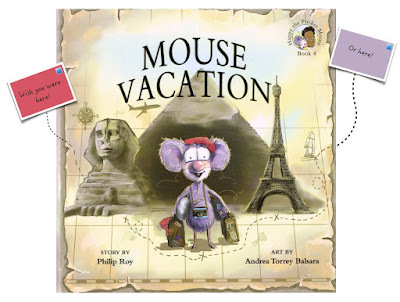 I’ve reviewed every Happy the Pocket Mouse story that Philip Roy and Andrea Torrey Balsara have created: Mouse Tales (Ronsdale, 2014); Jellybean Mouse (Ronsdale, 2014); and Mouse Pet (Ronsdale, 2015). 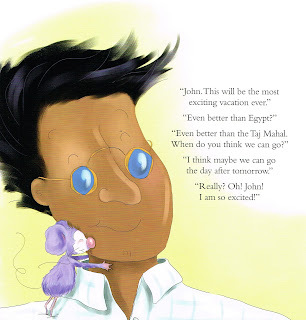 The foundation of each picture book is the endearing relationship between John and Happy. John is like the laid-back best friend/dad who radiates subtle wisdom and empathy while Happy is this adorable, adorable innocent whose heart is filled with love and mind brims with imagination. (I love the sweetness of his response to John’s suggestions: “That’s okay, John, we’ll just go somewhere else”; pg. 5) By having John and Happy working out what it means to take a vacation and finding a way to compromise, Philip Roy has again produced a charming life lesson in a story book. And Andrea Torrey Balsara flawlessly brings the story to visual completion, ensuring John looks like the man who is wise and caring and Happy is effusive with sweetness and virtue. 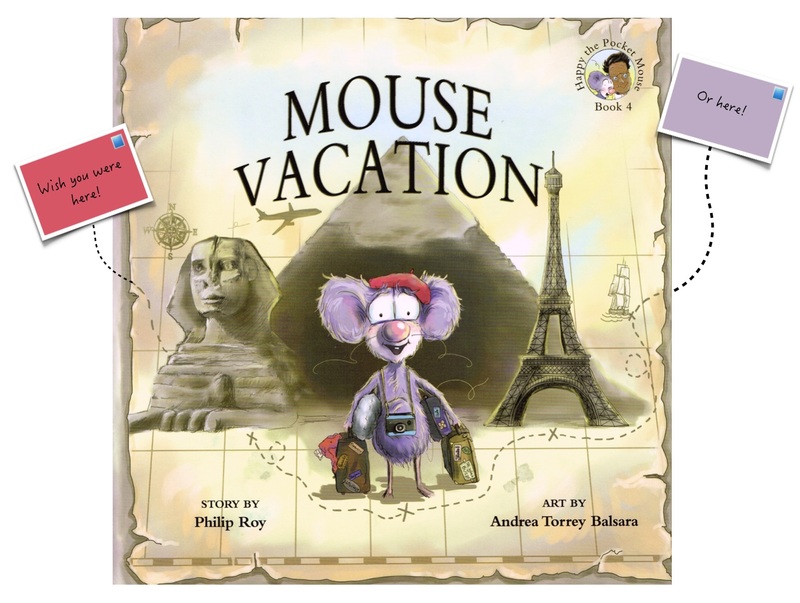 But, this time, Philip Roy’s story allows Andrea Torrey Balsara to create wild backgrounds for Happy: on a cow at the Taj Mahal, roasting a marshmallow over a candle while camping, riding a camel in Egypt, or sporting an “I ❤︎ NY” T-shirt. Still, the magic is in the collaboration, between the text and illustration and between John and Happy. That's what makes the story, and Philip Roy and Andrea Torrey Balsara have done it again, blending the two into a story of adventure for the mind, the heart and the soul. 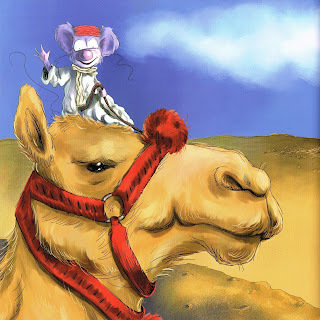 It was my pleasure, as it has been for every Happy the Pocket Mouse book. I love, love, love Happy!